Class act had many good hours playing blood bowl. Indeed, GW’s best game ever. The Blood Bowl background is full of puns and similar wordplay so its fun that you have taken it to heart. Part of the fun of regularly playing the same game with the same opponents is the running jokes and the like (I still cant see an Eldar Striking Scorpion miniature without the urge to break into song. A bad, bad song). It sounds like you guys are having a great league. 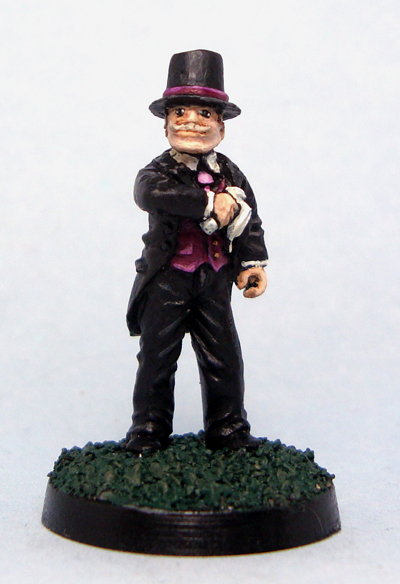 Nice work on the miniature: it looks eerily like Mr Muurinen. I am glad that you got some use out of the figure. I ended up with two of those bride and groom figures sets as part of a Black Cat Bases promotion that coincided with the royal wedding in the UK last year. I figured that I might get around to painting up the duo for zombie games, but there was no way that I would ever end up painting two sets. Its cool that you got some use out of one of them at least. You’ve really piqued my curiosity with the Eldar thing 😀 Thanks for the miniature, it turned out surprisingly useful! Its not big or clever and it definitely isnt a sophisticated play on words, but when people burst into the chorus of this whenever the word “scorpions” was mentioned (about ten times a game), I couldnt help but laugh (and sing for that matter). Try it some time if you dont believe me. Christ. That video is a sanctimonious, pompous and deluded load of ball-ache isnt it? That link didnt work. Youtube Scorpions Winds of Change if you feel like some audio torture. Aahah 😀 I can completely relate. Striking Scorpions will never be the same, thanks! I’d love to play a game with you guys some day. An international gaming meet is certainly possible at some point. You are very welcome to visit my place any time that you are in the vicinity Mikko. I have traveled to play games many times over the years. Although I would not enjoy visiting GWHQ to play 40K these days, I have many fond memories of those trips. I am off to Salute (London) with a gaming buddy in three weeks. I dont know if we will play any games or just look at all of the lovely stuff, but I have little doubt that we will have a few good laughs. Thanks for the welcome! Visiting Ireland has been on my bucket list forever, I think from listening to the Dubliners when I was six or so, and this just might give me an extra incentive to actually do so. I was actually going to go to Salute this year, but I’m in Malaysia at the time. The social aspect of gaming is a must for me as well. That’s why the BB league has been such an excellent experience so far. Salute is cool and all that but a trip to Malaysia > trip to Salute. Maybe next year. Enjoy Malaysia.